Below you will find a list of discussions in the Galaxy Nexus Graphics forums at the Galaxy Nexus Forum - Samsung Galaxy Nexus Community. 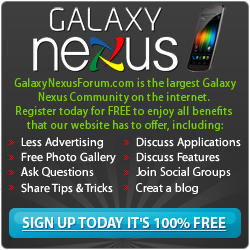 The Galaxy Nexus Graphics forum is for discussion of: This section is dedicated to all Galaxy Nexus Display discussions. This includes Wallpapers, Live Backgrounds, Pictures, Icons etc..
How to Theme your Nexus like a Super Boss! where can i find the description of default nexus icons? Anyone have smoke fonts up for grabs ? Is it possible to make a HD boot screen?